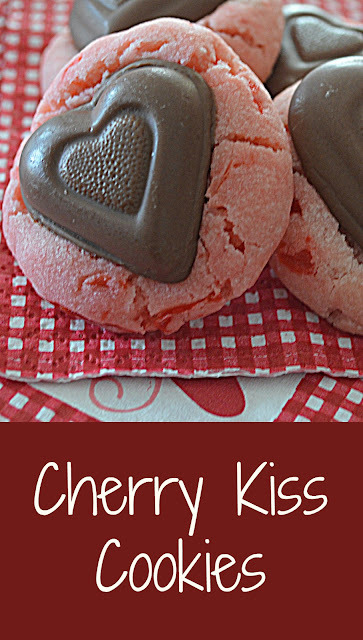 I really wanted to make these Cherry Kiss Cookies for Christmas, but since we already had so many cookies in the house I decided to hold these over until Valentine's Day. 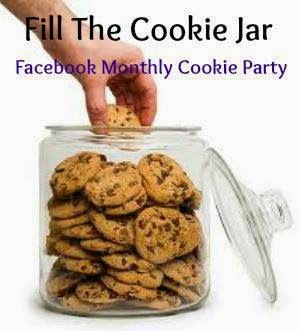 And, what a perfect cookie to Fill the Cookie Jar for February! I thought these were just the cutest cookie ever. And, while I do recommend using a Hershey's Kiss for them when you make them, I did use Hershey Hearts. The hearts were a little to much chocolate in my opinion. But, that didn't stop my husband for going crazy for them. We did have Truffle Kisses in the house at the time of my baking, and while they tasted fantastic on the cookie, they melted into a pile of chocolatey goodness. So, unless you are going for the cute factor, stick with the traditional Kisses! These are a perfect fun treat for your Valentine. If you want a little more of a cherry "pop" in the flavor, add another half teaspoon of the cherry juice. I think that would be really tasty. Preheat oven to 350 degrees. Line baking sheets with parchment paper, set aside. In large bowl, beat butter and powdered sugar. 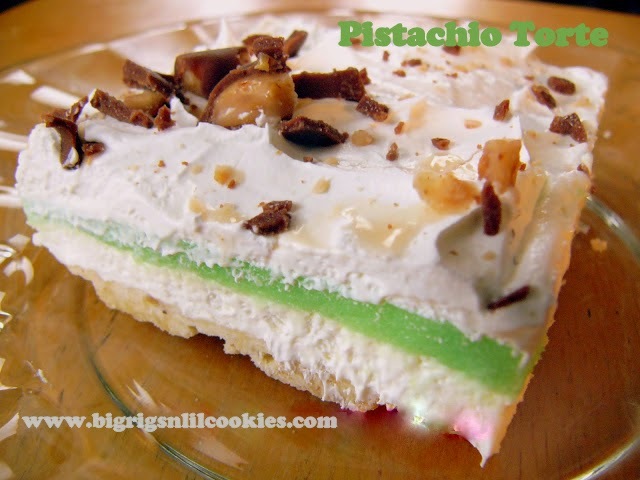 Once combined, add cherry juice, almond extract, and food coloring. Scrape down sides of bowl as needed. Gradually add flour, mixing until completely combined. Add chopped maraschino cherries, mix until cherries evenly distributed. Using small cookie scoop, roll into 1" balls. Place on lined cookie sheets 2 inches apart. Bake for 9-10 minutes, or until bottom of cookie is just turning golden. Remove from oven, and immediately press a Kiss into each cookie . Cool on baking sheet for 2-3 minutes, then transfer to cooling rack. Thanks Grace :) I agree on the heart shape. I just couldn't pass them up. How lovely and so perfect for the coming Vday! Love the addition of maraschino cherry juice to these cookies. Adorable. It really sends the cookie over the top! Hi Kris, these are perfect for Valentine's Day, love that you added cherry juice, great idea. It adds so much tot he cookie, Cheri!! Your cookies are so festive. Love them! You know I always love your cookie recipes and these look perfect for Valentine's Day! Kris, these are cookies the kids would love to make. I must give them a try on the next snow day, I know they will love them, just perfect for Valentine's Day. Joanne, I bet they would love them! Not wishing for another snow day, but hope you get to bake with the kids soon!! My family would love these festive cookies in our cookie jar! So perfect with the chocolate heart! These would like so fun in the cookie jar! Yum!! I will be giving them a try. :-) Perfect for Valentine's Day! These look DEEEEEEEEElicious and the hearts are super cute. I am not sure I believe in too much chocolate, so I think I'll give them a go this way now and with kisses on the next batch! YUm! Love the idea of using the cherry juice! It really completes the cookie and makes it unique! Son perfectas para el día del amor muy bellas,abrazos. What an incredible Valentine's cookie! Love this so much, perfect for Valentine! What a fun cookie! I love that you chose the chocolate heart instead of a regular kiss. So cute! Funny, these are similar to the cookies that I tried to make that just didn't turn out.. I tried to use frozen cherries instead of maraschino cherries.. and they just didn't work like what I wanted in the end. I have used the hershey hearts and I agree they are a lot of chocolate for the cookies, but oh so good and perfect for valentines.